♦ We provide the authentic look and feel of a Vegas Casino without the monetary risk or the travel. So your excited about your upcoming function and want to know where to start and how to get it all organised. Well, we can help with many aspects, but in regards to the Fun Casino and how it works Please read below or go to our FAQ page. On deciding to book a casino themed event with Brisbane Fun Casino, we will do a site visit to discuss options and numbers or, where it is not possible to do a site check, we will request information via email and pictures. At this time a deposit of 20% will be required. The general rule is 1 table per 15 or so guests. 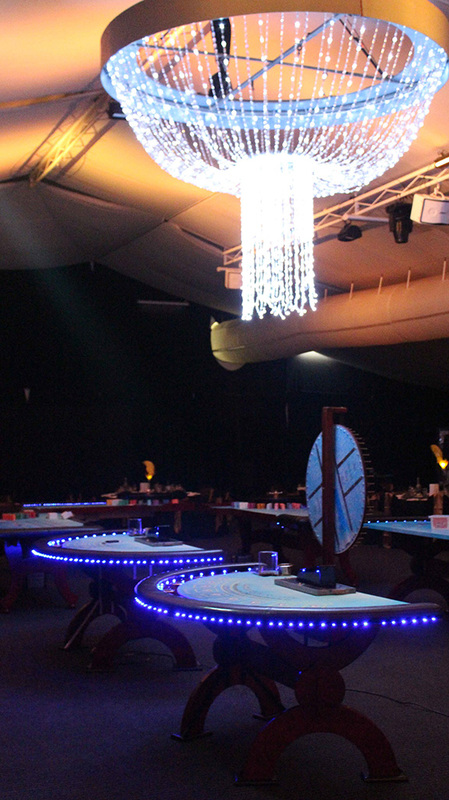 Each table can accommodate 10 to 12 people depending on the table, but not everybody will play all the time. A Blackjack table will require approx 3m x 2.5m, Money Wheel 3m x 4m and a poker or roulette table will need approx 4m x 2.5m to accommodate table and players. The Money wheel requires the same room as a Blackjack, but needs room for the wheel behind the dealer, usually around 3m x 3m. A poker table will also need 11 chairs to be provided by the venue or the host. We can provide chair covers which will match our tables, or the chairs can be left bare if you prefer. Fun money is printed specially for your event for you to distribute to your guests. No real money or buy-ins are permitted. A trophy plate is also engraved ready for the winner of the night. (not all events require a trophy). The standard event runs for 3 hours, extra hours can be booked in advance or on the night. The tables are set up prior to your first guests arriving. This allows all guests to walk the red carpet like royalty, before being “wowed” by the casino tables. Each guest receives a fun money note printed especially for your event, these should be distributed prior to the croupiers arriving for maximum play time. The croupiers will arrive around 10 minutes before the Fun Casino is to start. They will ensure the tables are ready for play and announce that the Casino is open. The players will take their fun money note to the table they want to play at and change the note for chips to be played with through the night. They can play on any table as long as there is space. For instructions of how to play the casino games and general casino etiquette please see our “how to play” page on this web site. At the end of the allocated playing time, the players with chips are asked to bring them to the table, they are then counted up and a winner is announced. A trophy if part of your package is then awarded to the winner. After a short period of time, we will start to prepare the tables ready to pack up. This is done in a discreet manner with no noise or interference to your guests. The next morning your guests will wake up declaring it “The best night they have ever had:” and you will be classed as a hero in the party world.